A question if I may! 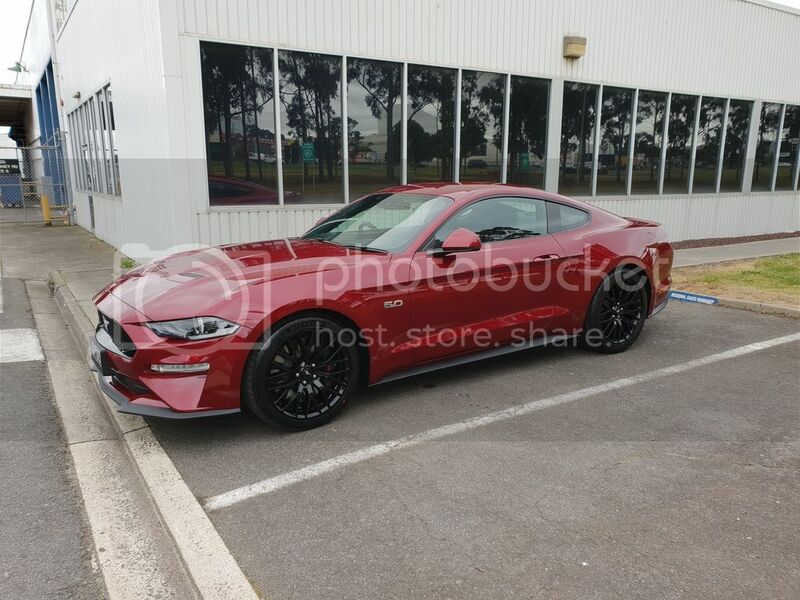 How many of our readers were sceptical about the sales success of Mustang in Australia? Hand up if you were questioning the sustainability of a niche lifestyle product in a very tough market! You might have been thinking about the rebirth of Monaro for example. Pent up demand for the return of something nostalgic, something with a hint of retro that was well executed and thought to one’s self will Mustang follow in those steps. A key component with repeat custom comes from continual evolution of the product, giving consumers a reason to come back and sample the changes and invest in the strength of those upgrades. To this, especially with a global icon as Mustang is, what freedoms are there to move the brand forward without messing with the tradition that defines it. After all, a big attraction to the brand comes from a legacy that’s significant in both longevity and desirability. Read coolness. A Mustang is one of those rare brands that transcends parochial barriers. You are either Ford of GM right? Not necessarily when it comes to Mustang. It is more neutral and while its recognised as a Ford product it outwardly projects its own image and values. 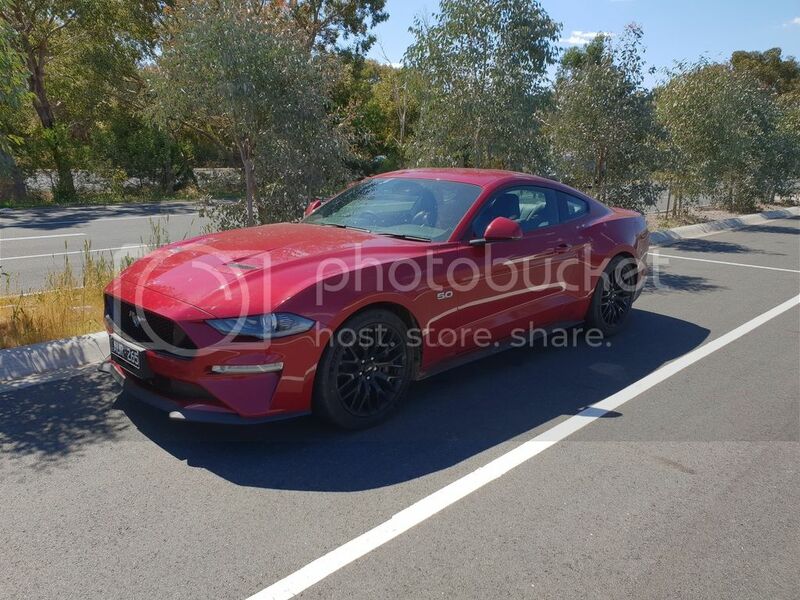 With the first facelift of the widely acceptable S550 model designation comes some questions on if Ford were able to tread the line of balance between being true to Mustang and delivering results that make consumers want to trade up or delve in for perhaps the first time. Read on to see how successful these changes have been and like us I am confident by the time you read that last word you will agree, this is no minor facelift. I, like the majority of people who witnessed the leak of the 18 face change, saw a new face that while aggressive, appeared to be less satisfying from a traditionalist stand point. 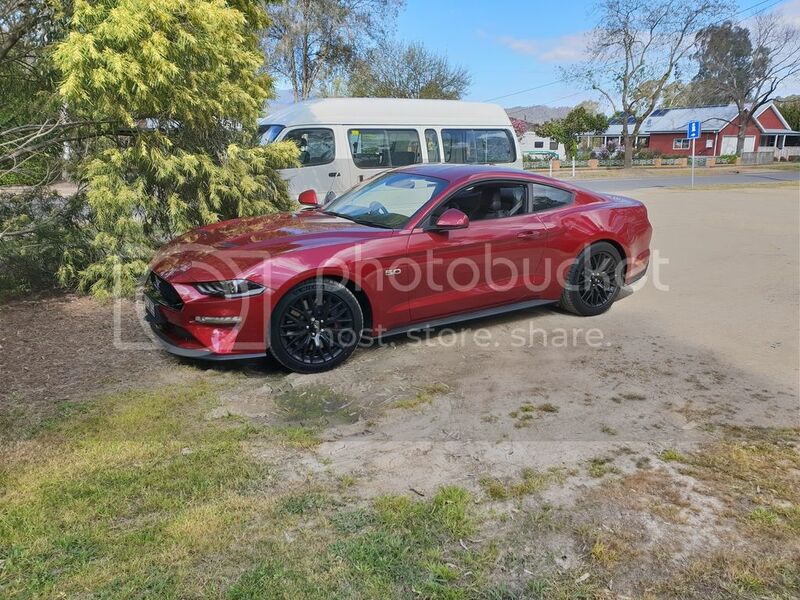 Admittedly, if one were to take a product of this lineage to a globally market, a big part of its success would need to come from being unmistakably Mustang. While not being a huge retro aficionado myself, the time spent in the 2016 model allowed me to conclude Ford nailed that introduction, an opinion that still stands today. If you are going to launch globally for the first time an icon of this calibre, leading with as much Mustang DNA as you can fit into that 4,784 mm length would be highly desirable. Time and exposure to the new face now has me applauding. It’s a meaner, angrier façade which suits the cars new demeanour perfectly. There were times when it was described as pure animal by us, a new attitude that like its face matches closer than ever the purity that is Mustang in its home country. From headlights and DTRL, through to the new bonnet treatment, the compromises between markets is not as it was. Lifting that redesigned and lower at the front edge by 25 mm bonnet feels heavier than it was and from the leather trimmed seats just the slightest bit less intimidation for visibility. More importantly for me though is this is consistent in all Mustang markets. It’s said changes to quality items in the interior were from direct consumer feedback from Asian and European markets. That’s a pretty good indication of where we are headed. I genuinely believe that for world markets a product like this cannot fall victim to its heritage as expectations of progression are high. I speak with absolute clarity on this aspect of this car. The 2018/19 moves the game on and in a way that’s significant. A quick recap on our last written opinion. How has the changes to MY 18 impacted on that previous opinion? It is sensory challenging from what we have come to expect. There is more theatre, more grip, more go, in fact any measurable dynamic criteria has been improved to the degree it is a mandatory experience for all Ford consumers and if you do that, we are confident you will love what this updated model brings to the table. The devil, as they say, is in the detail so for those so inclined read on. Our first acquaintance with the 2018 GT with 10 speed automatic was like Déjà vu. Ruby red with black rims, identical to our 2016 test car. I had to do a quick take of the front to see we had the updated car. I love the look and colour but I think it’s fair to say it’s (the colour) the one aspect that wasn’t greeted favourably by people we exposed it to. 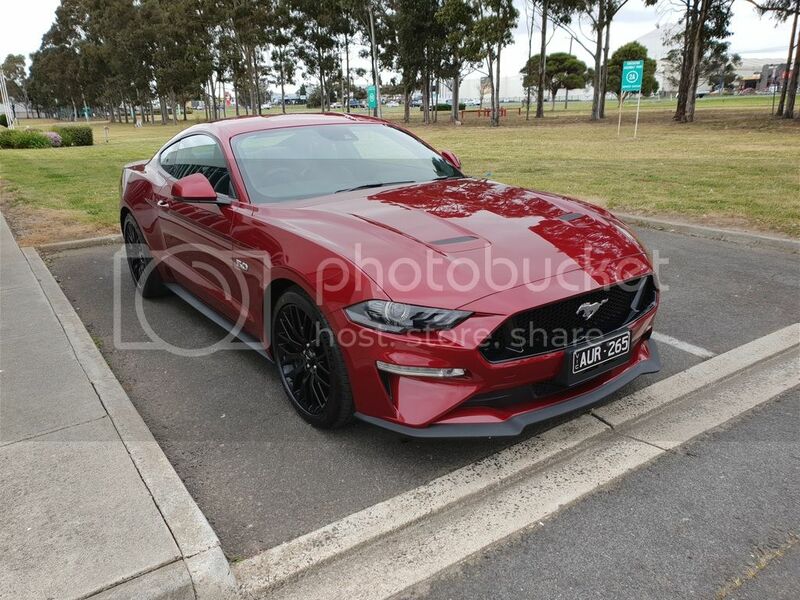 The sentiment was its just not Mustang where as I love it and would be on the short list of choice if it were to continue into the 19 model year which is what you get now if ordered. Fords new Ranger Raptor shares the same 10 speed auto. We asked for the 10 speed, this is the transmission we wanted to experience so it’s the first of three noticeable changes that grabs your attention pretty much immediately. 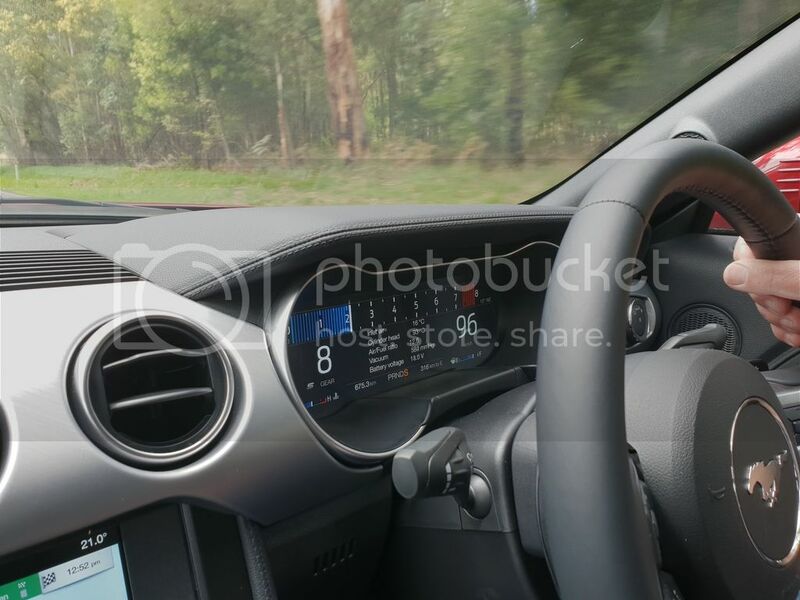 I had some real reservations as we hit 10th gear at 70kph on a slip road onto Sydney Road for the first time. Lots of questions started rolling through my mind, not all of them pleasant. I had a bit of a play with the steering paddles and noted like a lot of transmissions any intervention while in drive proved to be temporary before shifting back to full automatic mode. Sports plus on the transmission selector gives you full manual control once the paddles are activated that first time. Initially I didn’t think the response was great in manual mode but more on that later. That symphony from the new quad tips out the back has an element of straight pipes to it. Bellowing off the rock canyon we now find ourselves in, it is now one of those motoring moments that stays with you. The third is that digital dash. Three display options, with customisation colours are available but we settled for the racetrack view which incidentally was the way the car was handed to us. Forget what you know about numbers. The best way to describe this 10 speed automatic is like a 5 speed with half gears. It’s true when in full manual mode it will take some familiarity to get to know where the gears fit in with performance and road speed. I did however notice the reaction time was now very different to my first impressions. With the car now fully awake and on the job I am happy with this aspect but it has to be said leaving it to shift itself was, in our opinion, mega impressive. For me it truly shined just being left in sports plus. I know many of you want control. I want performance. I have control options in my life already so now I want maximum performance in my life. This transmission, while some of you might say it’s a lesser driving experience, I am saying it’s fast. It’s a very satisfying feeling the way the car work as it does. In this particular mode it’s is very aggressive under brakes, shifting down at the slightest brake application and rev matching while it does so. It’s the world’s greatest cheat and makes you feel like a dead set talented steerer. I absolutely had no issue with what it was doing and what that allowed me to do was to focus on getting the driving aspects right. To give you some perspective. In a manual car you might be using 2 gears in these conditions we now find ourselves in. In some cars it might be one gear the entire time. In our car it was two, maybe 3. There will be a separate thread on the transmission because it’s a topic that is going to be involved but that said, if I were ordering tomorrow, it would be this option. I can’t speak to the manual now because it too has been altered. The 18 now comes with the clutch from the GT 350. In the states some owners change the spring due to a feel issue. 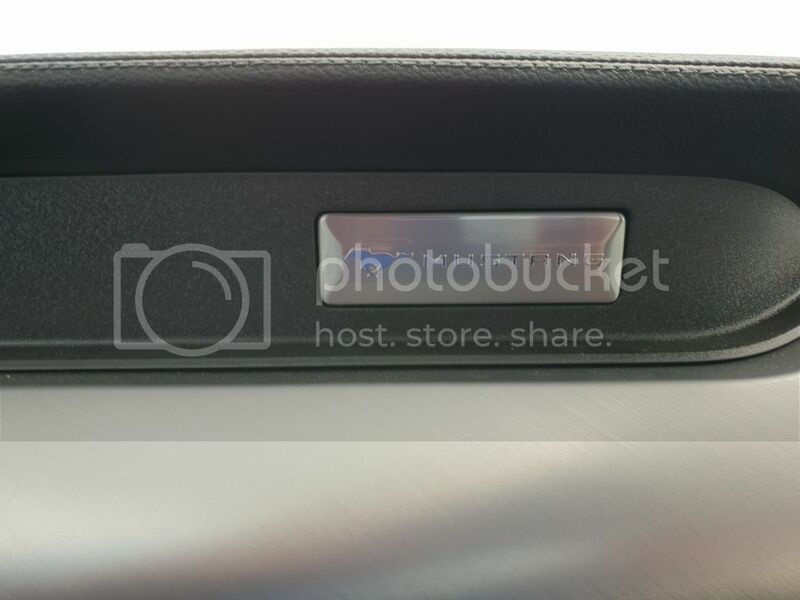 I am particular on manual box feel and usability requirements. I think it makes or breaks the manual experience, so I felt our last manual experience was a little hit and miss with clutch feel consistency. I note one “reviewers” opinion of the 18/19 set up claims it is easier and more consistent with shift quality over the 16 so that for me would need to be sampled. This would make the requirement to test mandatory for me but without that availability on this review, it’s the new 10 speed for me. It’s 99% shift quality impeccable and tuned very well to this engine. Those performance times of 4.5 seconds to 100kph are going to be on the money. A big part of that performance comes from grip and the suspensions ability to use it which moves us into talking about something that’s very important in a performance car. If I had an issue with the previous model it was with confidence of its rear suspension. This car has a new level of composure in the rear stability. Some of it will be the Michelin Pilot Sports 4 tyres but most of it is the way the car works those tyres. I say with confidence this because of the great range of varying conditions we encountered on this test. In fact, the composure and general ride quality was exceptional to the point I commented to Andrew it had a “Sprint” feel to the dampening. A familiar Ford DNA sensation that Sprint owners will recognise. The only question I have about this set up is if adaptive dampers are worth the option money. At $2750 my initial opinion would be if there is any improvement to the front of the car without hurting the rear balance, the spend would become mandatory for me. I would want to test back to back to be satisfied but it’s the one option that has my interest. If however you plan to modify and lower your 18 Mustang I don’t think it would take this damper route. Magaride, developed by the Delphi organisation, is something I have wanted incorporated in our cars for a long time. These dampers make a big difference to products like the HSV GTS and can be found in products that wear the famed Prancing Horse right through to SUVs from Land Rover. If the Pilot Sport tyres are the worlds go to fitment these days, then the same needs to be acknowledge for this type of damper activation. Ford are either equipping as standard or making as an option some very nice and complimenting standards of enhancements. Our usual disclaimer needs to be applied here. We aren’t bashing a car to within an inch of its life and that will make a difference in forming opinions. We are testing the way we feel you guys will drive and appreciate. I completely stand by that. It’s our point of difference that brings relativity to the table in ways you can relate to. At the heart of this beast is effectively an all new engine with direct and port fuel-injection, a higher compression ratio and a capacity increase to 5038cc. Revised heads with larger intake and exhaust valves lifts power to 339kW and to 556Nm. This represents a significant update for our market over what’s been offered stateside and goes a long way to contributing to a new lease of life in terms of response and urge. We also tested the limits of economy. This is a deceptive car or it would be if I hadn’t told you already the 4.5 second mark to 100 mph will be right. The way it gathers speed frequently had us disbelieving the speedo. Off to the Android store we go to download some speed check software only to reveal a 4-6kph overstate. To me, while lacking the torque sensation that is Miami, seat of the pants impressions put this package way closer to a 335 where as I felt the previous model was more XR6T 270. 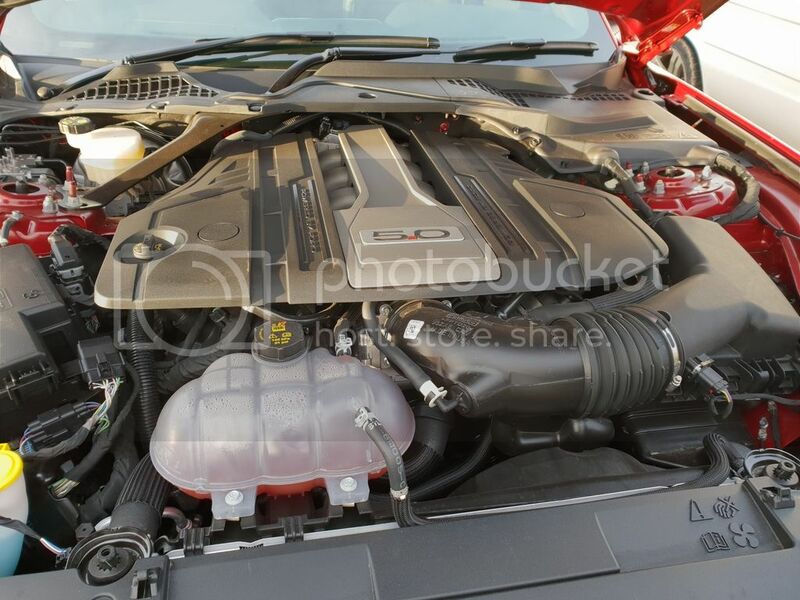 The trap speeds of quarter mile runs and indeed the dyno results so far suggest this engine is either understated or the improvement in driveline efficiency is giving us a big boost in usable, to the ground, motivation. 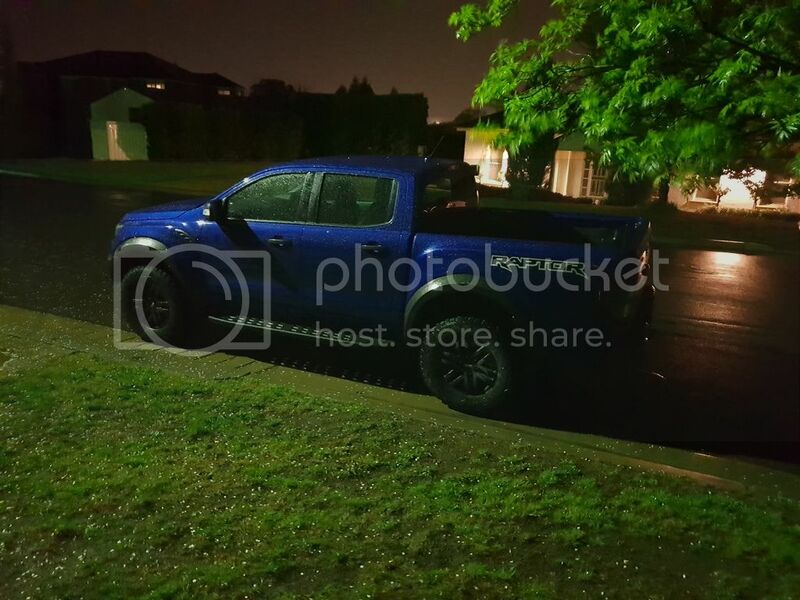 I am not sure if this has been officially verified by any mainstream outlet but potentially this is the fastest Ford offering for local consumption straight off the floor. Our sample had just 580kms when we picked it up so it’s best is still to come but at the same time we saw enough to know this is a serious performance car now. This is more FPV than XR, a comment that perhaps irritated some of our readers previously, but there is now no argument that content and intent align to justify the price. This feels like a more accomplished and more compelling proposition. Facebook readers had this to say about their hire car experience of the 18 model. Mark Anderson had this to say of his Hertz rental last week. Flappy paddle sports mode was fun too. Road feel was excellent, sports steering mode took out all the American Muscle sogginess that I was expecting. Cockpit was well laid out and intuitive. Forward vision over the beautiful bonnet bulge took a bit of adjusting to, but apart from being paranoid about the front lip when parking it wasn't an issue. Otherwise, I'd be off to the dealer tomorrow. edit: anyone in the market for a 10yo??? Indecently we endorse Marks solution to the accommodation quandary, it is that good. Love the exhaust, 10 speed is taking a bit to get used to but it's nice in sport. Blips on downshift cool. Steering feels funny compared to GTF to start off but seems to improve after a few ks and I wonder if it's the tyres till they warm up. Ride is a little harder on rough roads but that's how I like it. Another cool thing is the speed matching with car in front with cruise on. Biggest negative is the LH mirror angle. They seriously need to do a LH mirror for the RH market. In fact, the only dynamic attribute not enhanced appears to be the brakes and to be honest they were standout features previously. They did, once again, everything we asked of them with great feel, bite and fade resistance but with better grip from the Michelins I would expect reduced stopping distances too. Dialling everything back down to cruise mode, while that exhaust note keeps pulling your right foot back in, always tempting you with its character, it’s time to now reflect on the package as a whole. Yes there are new feel better plastics, tactility is up slightly. My biggest pet peeve in the handbrake location remains but now I find myself more forgiving such is the step up in the sensations that pull at the heart. Adaptive cruise, lane departure are two tech additions that allow a safety star increase and while nice, not high on my list of “must have” features. I did however appreciate the auto dimming headlights as these become the new “surprise and delight” feature knocking off the cooled seats that took that honour last outing. Who am I kidding, the exhaust sound takes out that honour. We have some recordings for you that don’t do it justice but yet it gives you an idea. While we miss out on performance pack 2 we do have more to choose from this time round. On the subject of seats, we now have a Recaro option. Our car wasn’t fitted with these, so I cannot comment other than to say the ones we saw at Bathurst in this car pictured looked great. The down side is you lose heating and cooling functionality which is a disappointment. 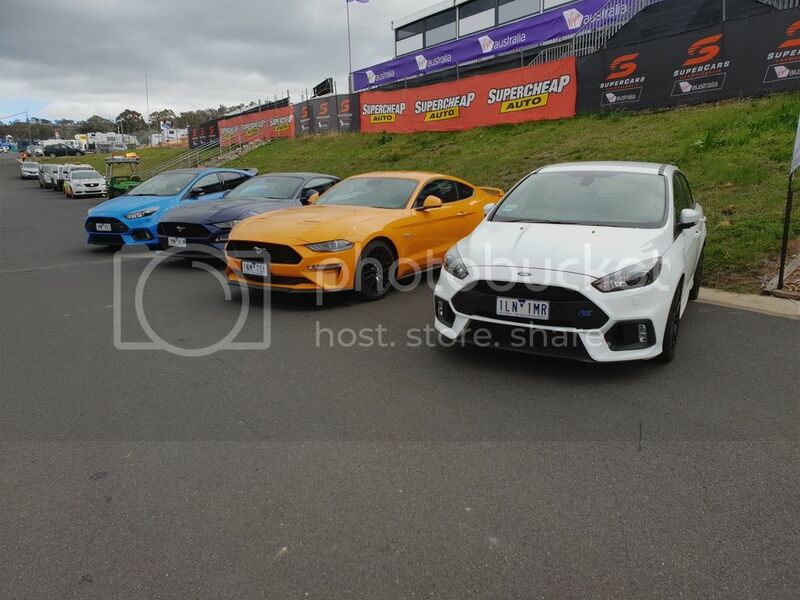 Was nice to see Ford drop off these examples for us to look over at Bathurst. I certainly had no issue with comfort and we were doing some long stints especially on day 1 of our review. I personally wouldn’t take the forged rim option and ditto the stripe package but I would be super keen on blind spot and heads-up-display if these were to make their way on to the option list sometime in the future. 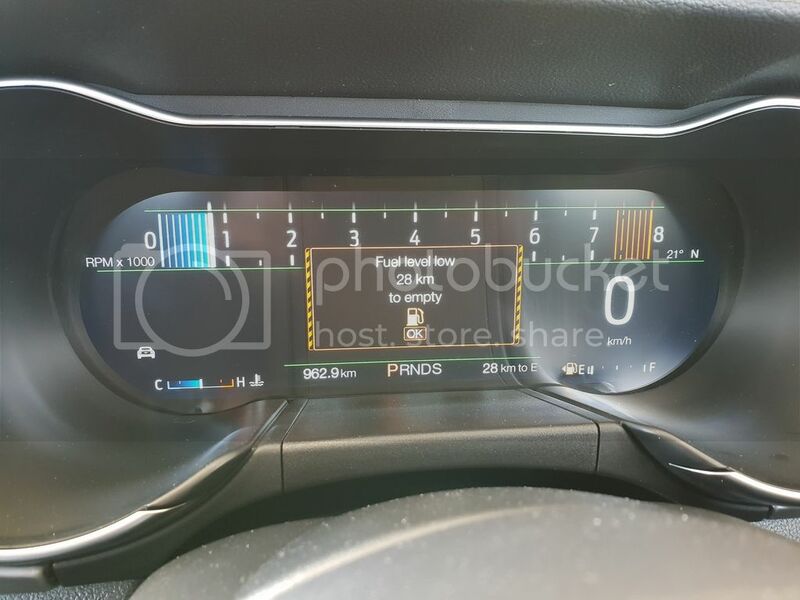 As mentioned earlier the new customisable instrument cluster brings in three display options, but more importantly has an excellent range of information right in front of you, including via the steering wheel, the ability to carry out satnav instructions and then have guidance appear on the screen. Resolution and clarity is excellent as can been seen in these pictures. I would categorise this update as being a more global product and that’s important. I think in these times the connectivity we have with the world allows us to determine if our products and experiences derived from them are consistent with other regions. This matters and I think that’s reflected for example in the change to the day time running light signature bars being as they are stateside and not just reflectors. The decrease in the power discrepancy between regions another such example. This is a wider focus that reveals how the Mustang as a global product is viewed internally. When one’s attention is drawn to a global icon such as Mustang that experience must be measured in purity terms because that’s what you are investing in. I want my Mustang experience to be the best version it can be and have universal synergy to that in its home market. This is clearly achieved here. As was the case previously our version is specified in a way that’s now very common for the Australian performance market. A higher ask in terms of price brings with it features that are expected in this market. Industry leading tyre selection with the option of industry leading damper technology, wrapped in a glorious sound track with stunning appearance, hints at what is possible as an on-paper suggestion. It is however the execution that jumps up from the spec sheet and hits you between the ears in very unexpected terms. The engine should be considered all new and when matched with this state-of-the-art joint venture 10 speed auto, the performance is a generational step up over the previous model. It’s a great looking machine with street cred in spades, a proper performance offering by Ford but more importantly answers that question on sustainability. This car is more performance, more features, more economy, more sound track, simply more Mustang. Yes, while there has been a price increase, viewing the product as the most compelling thus far offered brings compulsion from both the perspective of trading up and for that potential owner that’s been sitting on the fence till now. All Ford fans need to drive this car. Unequivocally this is the Mustang you want in your garage, its key in your hand. Quiet mode drive by. As you watch these you will hear that the RPM and being under load is very different. The first part of every run is at a constant rpm. 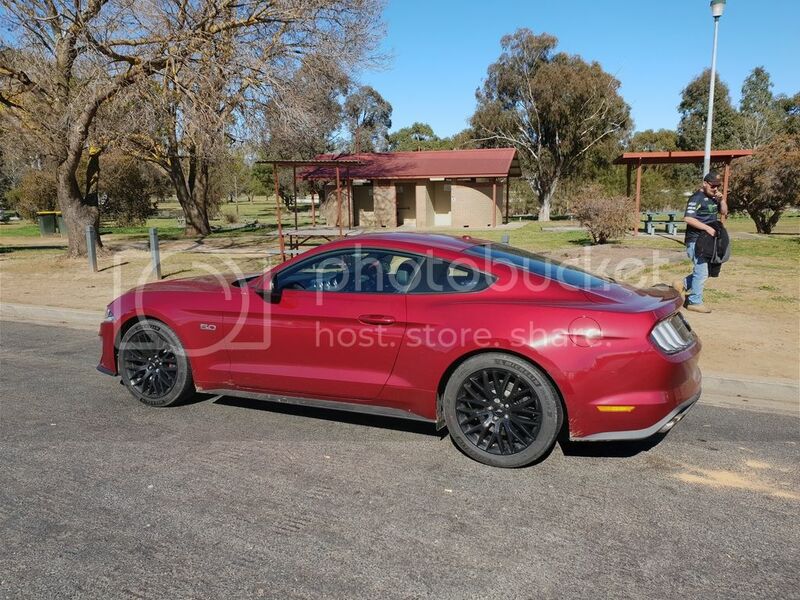 A special thanks must go out to Ford Australia for allowing this opportunity. To Andrew for coming along on what was a very long first day. I'll admit I was one of those early critics "it'll be like the Monaro" I said. I'm more impressed with the writing of this piece. A far better job than I could have done. Brilliant review and write up Ian and Andrew. Those videos. I have listened to them all several times now. Very addictive. Last edited by WASP; 5th November 2018 at 02:19 PM.